Grab This E-book To Learn The Strategies On How You Can Have Your Very Own E-book Or Audio Product In One Day… Even Works If You Are Brand Spanking New In Internet Marketing! Ghostwriters, graphic designers, copywriters and other service providers can be really costly if you do not know what you are doing or you are just starting out for the first time. There are lots of components involved – compiling the content, doing a thorough research, writing a sales letter, creating your own E-cover, etc… it is no wonder many people are turning to AdSense or affiliate marketing. Thankfully, there is a way to create products easily without worrying about outsourcing and spending all that money. And no, it has nothing to do with cutting and pasting an entire E-book with PLR (Private Label Rights) and calling it your own. Yes, PLR is handy, but I’m talking about ORIGINAL, brand new products that you can call your own. After all, there is a much easier way to get a product created very easily and it can work for you even if you can’t write your way out of a paper bag! 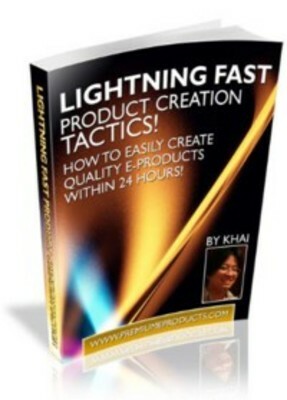 Time Is Money… So In Order To Get Ahead Of The Competition, Learning The Kill Of Creating Lightning Fast Products Within 24 Hours Is Extremely Critical! 24 hours – I’m not kidding. Learning the skill of creating fast products isn’t hard, whether it is an E-book or an audio product. Not only will you learn how to create a product, you can learn how to accompany your product with an E-cover (or equivalent graphic) and a sales letter to go with it. A Simple, Yet Complete Blueprint That Teaches You Step-By-Step. You can execute this within 24 hours as well. The Various Tools You Will Need To Get Started. You need to equip yourself with all the necessary tools to get started immediately. How To Literally Get Others To Create The Content For You, FREE OF CHARGE! It is so simple; you can literally rinse and repeat this strategy over and over again! How To Customize Your Own E-covers. There is a very simple way to do it even if you do not have a talent for creating graphics! Write Your Own Sales Letters EASILY! You can fire your copywriter and do this yourself. Even works if you can’t write very well. Get People To Endorse Your Product! Simple ways to get testimonials and feedback for your product. You will be able to have your own product up and running within one day. No waiting for months before you start making your first buck. Don’t worry. It won’t cost you an arm or a leg. I am only going to charge you a measly $37 for this product. Actually, some people tell me that $37 is too little but I’m still going to let you have it so you can work these strategies right away. Lightning Fast Product Creation getting produc;product creation;products 87835417 5.00 satyuga Fresh Download Available!